Over Christmas I had a chance to experiment with the European Patent Office’s Online Patent Services. This is a web service / application programming interface (API) for accessing the large patent databases administered by the European Patent Office. It has enormous potential. Obtain a text file of publication numbers. Most patent management systems (e.g. Inprotech) will allow you to export to Excel. I copied and pasted from an Excel column into a text file, which resulted in a list of publication numbers separated by new line (“\n”) elements. Register for a free EPO OPS account here: http://www.epo.org/searching/free/ops.html . About a day later the account was approved. Setup an “app” at the EPO Developer Portal. After registering you will receive an email with a link to do this. Generally the link is something like: https://developers.epo.org/user/[your no.]/apps. You will be asked to login. Read the documentation. Especially ‘OPS version 3.1 documentation – version 1.2.10 ‘. Also see this document for a description of the XML Schema (it may be easier than looking at the schema itself). Now onto some code. First we need to use that key and secret to authenticate ourselves using OAuth. This results in an access token you can use to access the API for 20 minutes. Once authentication is sorted, getting the data is pretty easy. This time I used the later urllib2 library. The URL was built as a concatenation of a static look-up string and the publication number as a variable. The request uses an “Authentication” header with a “Bearer” variable containing the access token. You also need to add some error handling for when your allotted 20 minutes runs out – I looked for an error message mentioning an invalid access token and then re-performed the authentication if this was detected. I was looking at “Biblio” data. This returned the classifications without the added overhead of the full-text and claims. The response is XML constructed according to the schema described in the Docs above. We now need to play around with the returned XML. Python offers a couple of libraries to do this, including Minidom and ElementTree. ElementTree is preferred for memory-management reasons but I found that the iter() / getiterator() methods to be a bit dodgy in the version I was using, so I fell back on using Minidom. As the “Biblio” data includes all publications (e.g. A1, A2, A3, B1 etc), I selected the first publication in the data for my purposes (otherwise there would be a duplication of classifications). To do this I selected the first “<exchange-document>” tag and its child tags. As I was experimenting, I actually extracted the classification data as two separate types: text and XML. Text data for each classification, simply a string such as “G11B 27/ 00 A I”, can be found in the “<classification-ipcr>” tag. However, when looking at different levels of classification this single string was a bit cumbersome. I thus also dumped an XML tag – “<patent-classification>” – containing a structured form of the classification, with child tags for “<section>”, “<class>”, “<subclass>”, “<main-group>” and “<subgroup>”. My function saved the text data in a list and the extracted XML in a new XML string. This allowed me to save these structures to disk, more so I could pick up at a later date without continually hitting the EPO data servers. The last lines print the resulting dictionary and then save it in a file for later use. 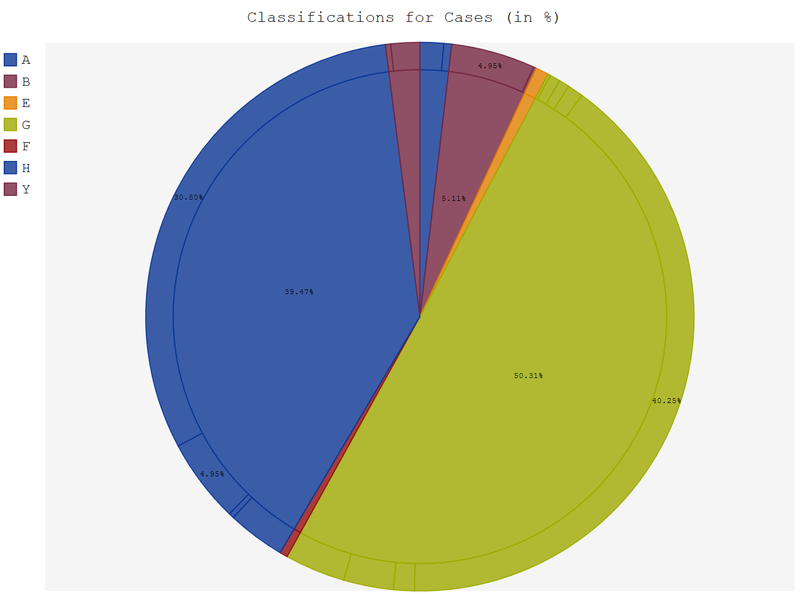 After looking at the results it was clear that past the “class” level the data was not that useful for a high-level pie-chart, there were many counts of ‘1’ and a few larger clusters. I stumbled across Pygal a while ago. It is a simple little charting library that produces some nice-looking SVG charts. Another alternative is ‘matlibplot‘. The methods are straightforward. The code below puts a rim on the pie-chart with a breakdown of the class data. That’s it. We now have a file called “class_graph” that we can open in our browser. The result is shown in the pie-chart above, which shows the subject-areas where I work. Mainly split between G and H. The complete code can be found on GitHub: https://github.com/benhoyle/EPOops. Getting the data from a patent management system directly (e.g. via an SQL connection in Python). Adding the routine as a dynamic look-up on a patent attorney website – e.g. on a Django or Flask-based site. Look up classification names using the classification API. The make-up of a representative’s cases would change fairly slowly (e.g. once a week for an update). Hence, you could easily cache most of the data, requiring few look-ups of EPO data (the limit is 2.5GB/week for a free account). Doing other charting – for example you could plot countries on Pygal’s world map. Adapt for applicants / representatives using EPO OPS queries to retrieve the publication numbers or XML to process. Looking at more complex requests, full-text data could be retrieved and imported into natural language processing libraries. Previous Post Can You Mine Patent [Big] Data at Home? Next Post Patents: Another Language?